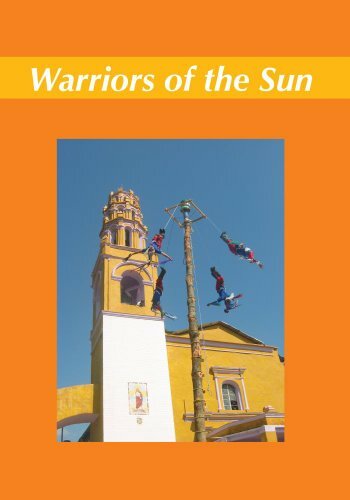 In a world where valued traditions are threatened by globalization, the Totonac Indians of Mexico struggle to maintain the 2000 year old Los Voladores (the flyers) ritual, a visual representation of pre-Conquest Mexican Indian religion. The Voladores represent warriors killed in battle or sacrificed on the altar, who return as hawks and eagles. They follow the Sun to the zenith, then descend to earth to bring the life-giving gifts of the Sun to the earth and its creatures. At El Tajin, the ruins of the ancient Totonac capital, Father Mario Pérez, a Catholic priest, demonstrates for visiting Totonac high school students how the Voladores ritual continues the same cosmology expressed in the ancient ruins. In a vision, Christ introduces 17 year-old Ivan, a Totonac high school student, to God, who commands him to revive the Voladores ritual, last performed in his community two generations ago. Under the direction of Salvador, the old Volador leader, Ivan and his friends learn the dance steps, the music, and the inner meaning of the ritual. Helped by other Totonacs, they erect a 30 foot practice pole where the terrified teens make their first, hilarious, flight. The Mexican mayor of the village urges the new Voladores to attract tourism, but the Totonacs reject his offer, and unite to preserve their identity, embodied in the ancient ritual. After more training, the students are ready to fly from the real 80 foot high pole in the churchyard. At the midnight mass on Christmas eve, the priest blesses the new Voladores, and invites them to dance around the altar. The next morning they climb the big pole and fly to earth before an admiring crowd. A Totonac elder tells how, once upon a time, the hub lifted off the pole and the Voladores were carried away. In their absence, the mayor chopped down the tree for firewood. When the Voladores returned, they could not land since there was no pole, so they flew away again, to live forever in the branches of the Tree Of Life. If you have any questions about this product by Ethnoscope Film & Video, contact us by completing and submitting the form below. If you are looking for a specif part number, please include it with your message.